Distillation is a method for separating mixtures based on their different boiling points. The separation is conducted by boiling and condensation. What happens to the temperature of a liquid during the boiling process? You might think that the temperature goes up smoothly, but this is not so. The graph of temperature against time is called a heating curve. In general, the longer the heating continues, the temperature goes up. However, there are horizontal flat parts on the graph which happen when there is a change of state. The plateaus are also called phase changes. 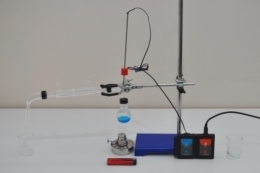 With this kit you will be able to investigate this fascinating behavior through measurements of both pure water and a mixture of water and alcohol or acetone. 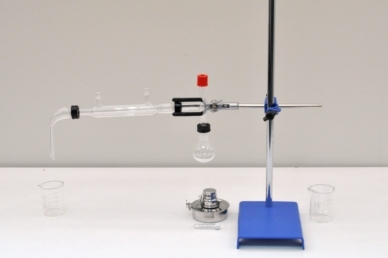 Still head, 25 ml round bottom flask, Condenser, Receiver, Alcohol lamp, Two 50 ml beakers, Utility stand, Right angle clamp, Extension clamp, Four boiling stones.